American Wolf: The Best of 2012. "Go ahead, make my chair." Much to the Mayans' chagrin, the world moves on from 2012 to 2013. What happens when the greatest living director teams up with the greatest living actor to tell the story of America's greatest-ever president? Something close to perfection. By focusing in on Lincoln's struggle to get the 13th Amendment passed over a precious few weeks, Lincoln tells the story of an entire man's life & the modern nation he helped bring into being. The lines blur between history, drama, comedy, & tragedy in a way that few films have been able to achieve. & at the center of it all is Lincoln, who plots, plans, theorizes, schemes, schmoozes, & charms his actions into a singular gesture of political genius. Films aside, it's been a great year for movies—The Avengers, The Hunger Games, & Dark Knight Rises all somehow lived up to their hype & more, but for me, Argo stood above the rest as a testament to great movie-making. It probably has to do with the fact that, at its center, Argo is a love-letter to the movie industry. In spinning an essentially-true tall-tale about a government agent who frees a group of Americans in Iran by posing them as a film-crew scouting a sci-fi B-movie, actor/director Ben Affleck never lets up as he takes you along for the ride—& near-failures—of his elaborate sting operation. Many critics have noted that the movie also sets up the modern Middle Eastern world, but would anyone care if it wasn't super-fun to watch? As the man said, Argo f_ck yerself. 2012 has been a renaissance year for the art form known as the sitcom. Parks & Recreation is the most charming, New Girl is the most improved, Happy Endings is the most consistent, but Community is most progressive, which for me is why it takes the cake. Not since Seinfeld has a mainstream sitcom pushed the boundaries as much as Community, & its 2011-2012 third season was its weirdest & most wonderful yet. Each episode was often little more than a shell for a 22-minute experiment: One episode was a spot-on send-up of Law & Order, another had the characters breaking out into song Glee-style, & yet another took place entirely inside a video game designed in the 1980s. But standing above them all was "Remedial Chaos Theory," in which the episode reveals 7 different alternate realities unfolding depending on who answers the door to get a pizza. Yeah, like everything else in Community's self-referential little world, it has to be seen to be understood, but once yer in, you are in. Best Song: "We Are Never Getting Back Together" by Taylor Swift. Every once in a while, an instant anthem comes out that captures the imagination by knocking down walls simply by existing. Here we have a country star-turned-pop diva, embracing her stardom with a knowing wink to the hipsters who she'll never be cool enough for, & beating/joining them with a sound, look, & video that sounds like it was masterminded by Wes Anderson's kid brother. The video is the stunner—a rare one-shot masterpiece (check my list of the best ones here)—walking the line between sleek pop & cool rock in a wholly stylish & stylized way. Oh yeah, & the fact that it was sinking into the national consciousness right around the time when Mitt Romney was breaking up with the Republican Party didn't hurt. Best Book: Thomas Jefferson: The Art of Power, by Jon Meacham. Disclosure: I have not read this book. But it's about Thomas Jefferson & by Jon Meacham, so what's not to love? Plus, it's got "Art" in the title. Love it already. All I need to do is finish my copy of Goodwin's Team of Rivals & then read Chernow's Washington: A Life (which has been on deck fer a year now—if only I could read as fast as I could spout Elvis fun facts! ), & then I'll go out & buy my copy. & then read it. But aside from that minor detail, this book is phenomenal. Best Stage Performance: Death of a Salesman, with Philip Seymour Hoffman. Disclosure #2: I did not see this play. But I have a good friend who saw it & said it was great. I think this is the greatest play in American history, so I know I woulda loved it. Plus, it had the creepy cult dude from The Master & Spiderman from Spiderman, both of which I did see this year. The Master was pretty f_cked up, but Hoffman is compelling as always, & Spiderman was great, although truth be told I could watch a movie featuring Emma Stone reading a phonebook & I'd probably be just as contented. Now how can we get Emma Stone into a production of Death of a Salesman...? There are two types of people in the world: People who are addicted to Angry Birds & people who've never tried playing it. Cuz once you start, you can't stop—it's SOOO much better than thinking. "Hey there newspapers, TV, & radio punditry! Sorry I took all yer jobs! I am all-powerful! I'd write more, but I only have 140 characters!" Best Reissue: Nuggets: Original Artyfacts From the First Psychedelic Era, 1965-1968. What's the most influential rock album that had never before been available as a stand-alone CD? Nuggets. Masterminded by Lenny Kaye (guitarist & leader of the Patti Smith Group), this was a collection of garage rock that took the music just to the cusp of punk, yes, but it was also a freakshow of hits, misses, & rarities culled from the cutout bins of rock & roll—a fuzz-tone medicine show put on by all of the losers, fakers, wanna-be's, one-hit wonders, & no-hit wonders that took the chance at 15 seconds of fame in the spotlight. Despite making every definitive Rolling Stone list from the '80s onward, the album was nowhere to be found until Rhino reissued it as the first disc of a four-disc boxed set in the mid-'90s. Now for the first time, you can get it just by itself, & bask in a weird, weird underworld of '60s rock that wouldn't be caught dead on a Time-Life informercial. 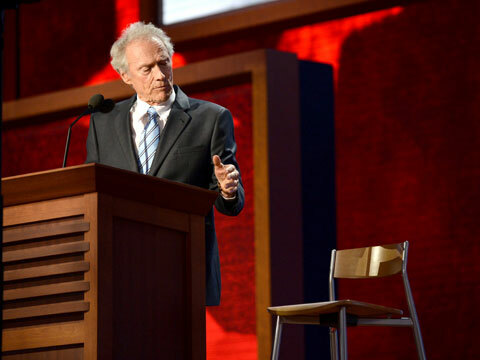 Best Performance Art Piece: Clint Eastwood's RNC Speech. Q: What do you get when you cross a grizzled actor, a national convention, & a chair?